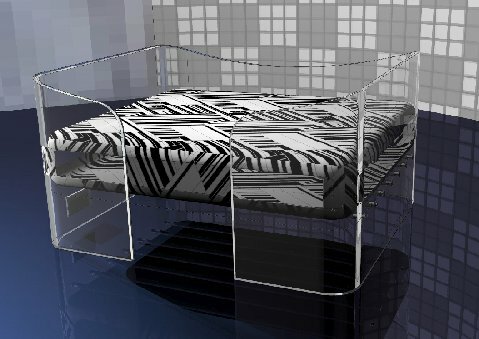 I have difficulty finding modern pet beds for my dogs. The full size breeds just don't lend themselves to sleeping under tiny houses disguised as plant stands. My two sleep on plain circular beds once plush with cedar shavings and white, fluffy fibers, now depleted. It's time to replace, and I'd rather not have to do it every 6 months. 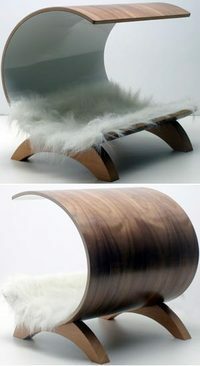 So I've been casually searching around for the right modern dog beds. Lo and behold, I found a slew of options in an unlikely place. All on Overstock for $66- $236. Leifers luxury pet home retreats and products are designed to serve as attractive home accents while being a pampering environment for pets to rest their paws. It's a bit Romanesque for my taste, but replace the fern-like plant with some funky foliage or colored orbs and it could be a nice addition to a modern home. You know how much I love animals, and my strong feelings on providing them with thoughtful Christmas gifts. While cats aren't my personal fave, I do not begrudge them their holiday tidings. The Kittypod Mini from Elizabeth Paige Smith. So the other night I'm blissfully sleeping in my comfy bed. Suddenly, at 4am, I awake to the sound of my dog pacing around the house. My 75 pound boxer has severe allergies and IBS. I know, a dog with Irritable Bowel Syndrome, nice huh? When he paces it means only one thing -- he's sick. I lay in bed, willing him to lay down and go back to bed. Five minutes later I hear a strange noise, almost like a bunch of empty soda cans crashing to the floor. I jump up and head to the kitchen. Nothing there. I walk into the living room and see my boxer cowering, head down and shaking. I glance down to the floor and see what appears to be chocolate pudding all over the hardwood -- and his dog bed. Great! Doggie diarrhea at 4 in the morning. I won't bore you with the disgusting details, but needless to say, he needs a new bed. Here are a few fun pads. Pictured: Contour Dog Bed, Dog Bed from C. Bell, and the Holden Dog Bed. 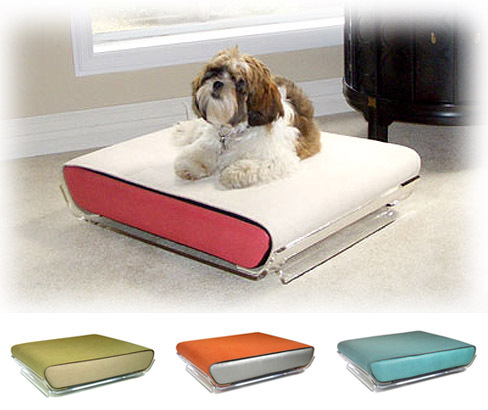 Search Modern Dog Beds now! Modular design went natural with Sternform's debut of Piu at the Ambiente fair in Frankfurt last week. Piu is a birdhouse that transforms to a nesting place and back again with the simple removal of a piece. This design is spare while delivering everything a bird needs. Our only gripe - why can't they have a place to eat and a place to sleep at the same time? Perhaps this is Sterform's way of ensuring we buy at least two. They love you unconditionally -- shouldn't you take every opportunity to do the same? 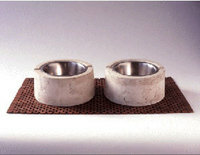 This Valentine's Day take the most direct path to your pets heart -- his stomach! 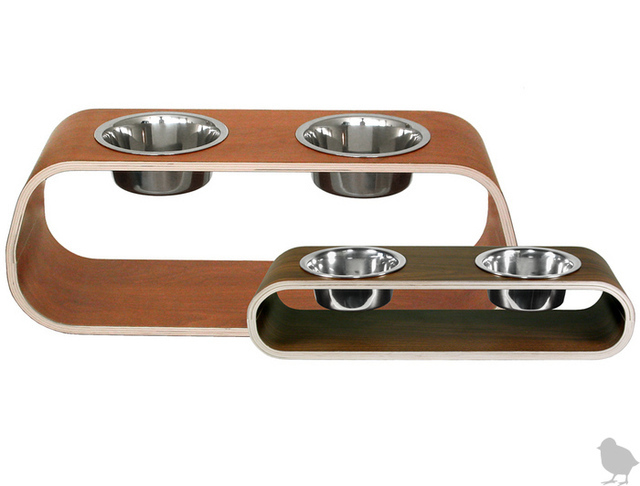 The Holden Designs Pet Feeders are stylish and functional -- with stainless steel bowls (a must) and bent wood in cherry or walnut. 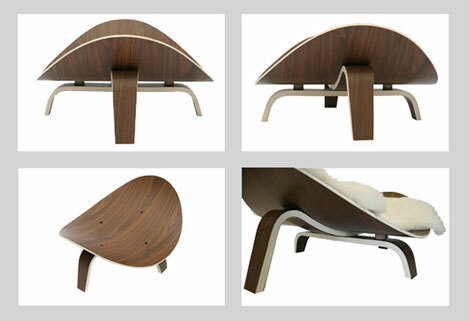 Buy it now at Design Public. They're a part of the family too! Don't forget Fido this holiday season. 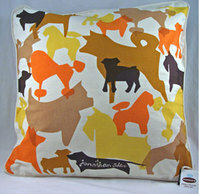 Check out a few of my faves (WOWO dog bed, Stockholm dog bed from Jonathan Adler, Doggie Dinnerware from Clodagh). Perhaps unsure of how this gem would sell, Steuben glass started with a "beta launch" of five limited edition Crystal Reef Fish Bowls by Michele Oka Doner. Just over 11 inches in diameter the crystal fish bowl sits atop a cluster of coral cast of (what else?) more Steuben crystal. 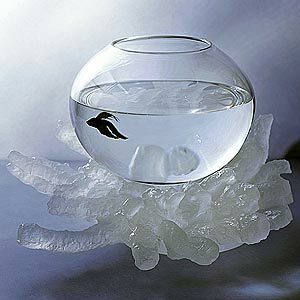 For the minimalist aquarium hobbyist, this bowl would hold one lucky beta. Interested? Steuben encourages impulse purchasing. Go to the site, add it to your cart and proceed to check out. But for this ultra luxury fish bowl, you'll have to part with $23,000. These new mugs from Thorsten van Elten really gave me a chuckle. They're high quality porcelain, nothing odd about them––until you take a sip. The bottom reveals an animal snout: dog, pig or rabbit. A good way to start the day, for $20 through Charles and Marie. As I previously stated -- I love my dog, I really do. He is spoiled, pampered, and catered by all who cross his path. And during these lazy summer days, he accompanies me almost everything -- especially if it involves the outdoors. 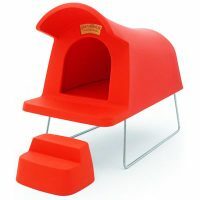 The Magis Orange Dog House -- for $900 your modern canine can relax in style. Love it or leave it? Post your comments below!